Due much, it is said, to the 17th century Cartesian divorce of mind from body, knowing consciousness has been mostly set aside as a spurious epiphenomenon. But into the 21st century, by way of novel turns and advances in philosophies of mind and neuroscience capabilities, mindful awareness has become a legitimate subject for research and validation. David Chalmers and Thomas Nagel, both at NYU, are among leading commentators. A stirring sentience is now perceived to arise through life's long evolution to human acumen, as also noted in the An Intrinsic Consciousness and Intelligence, Animal Intelligence and Awareness, sections and throughout. Into the later 2010s, two main approaches have come to the fore – a whole brain Global Workspace Model (Bernard Baars, et al), and especially an Integrated Information Theory due to Giulio Tononi, along with Larissa Albantakis, Christoph Koch, Masafumi Oizumi and a growing list. As Pierre Teilhard noted seven decades ago, life’s developmental gestation can be seen to advance as an episodic tandem of relative sensation and complex knowledge. In regard the image is from an international conference held at the University of Arizona. Ananthaswamy, Anil. Brain Chat. New Scientist. March 20, 2010. A report on the growing verification of Bernard Baars’ and colleagues such as Stanislas Dehaene’s theory of a “global workspace” whereof if enough neurons distributed across disparate cerebral regions enjoin and “talk” to each other in unison, then out pops consciousness. Baars, Bernard. The Conscious Access Hypothesis. Trends in Cognitive Science. 6/1, 2002. This phrase is offered as another name for “global workspace theory” (see Dehaene and Naccache below) whose “massive distributed set of specialized networks” gives rise to and verifies an informed consciousness. Baars, Bernard, et al, eds. 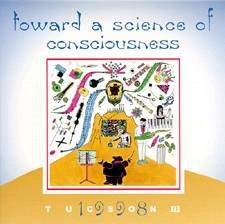 Essential Sources in the Scientific Study of Consciousness. Cambridge: MIT Press, 2003. A comprehensive reference with over 60 articles on the admission and recognition of reflective sentience as a respectable subject. Bieberich, Erhard. Recurrent Fractal Neural Networks. BioSystems. 66/3, 2002. The brain is composed of self-similar systems from a ‘global coding structure’ to neuronal networks. A consistent mapping occurs throughout its many-layered, dendritic architecture. By this view, the same fractal data and pixel compression used in computers may be the way a ‘fractally structured memory’ is formed. Bieberich then sees his theory to converge with Bernard Baars ‘global workspace model’ as the seat of consciousness. Boly, Melanie, et al. Consciousness in Humans and Non-Human Animals. Frontiers in Psychology. 4/625, 2013. A joint commentary on a July 2012 meeting in Rockport, Maine organized by the Mind Science Foundation. With authoritative attendees such as Bernard Baars, Steven Laureys, Melanie Wilke, others, these studies are said to attain a mature synthesis. It is thus averred this phenomena is real, fundamental, and amenable to scientific study. In accord with concurrent papers by Tononi, Koch, Dehaene, and colleagues herein, the global workspace and integrated information theories are seen as good explanations. Along with contributions from animal cognition research and more, a gradated continuum is affirmed throughout the creaturely kingdoms and an evolutionary scale from the earliest invertebrates to Maine Mind. Bor, Daniel. The Ravenous Brain: How the New Science of Consciousness Explains Our Insatiable Search for Meaning. New York: Basic Books, 2012. In this accessible work, a University of Sussex, Sackler Centre for Conscious Science, researcher equates the rise of knowing visuospatial awareness with its survival value of being able to perceive crucial, fluid environmental patterns. Early chapters such as “Evolution and the Science of Thought” consider proponents such as Gerald Edelman, Giulio Tononi, and the global workspace model of Bernard Baars and Stanislas Dehaene. In perspective, an engaging entry to an apparent awakening human cosmos that seems to be trying to better recognize and create itself. Bronfman, Zohar, et al. The Transition to Minimal Consciousness through the Evolution of Associative Learning. Frontiers in Psychology. December, 2016. Israeli scholars of science EB, Simona Ginsburg and Eva Jablonka, with colleagues, continue their endeavor to properly identify life’s essential advance as a relative analogical increase in aware cerebral knowledge. In March 2019 The Evolution of the Sensitive Soul: Learning and the Origins of Consciousness by S. Ginsburg and E. Jablonka (MIT Press) will provide a book length essay. By this view, in some real way a bioworld and cosmos is on a track to evolve and emerge in complexity and sentience so to come to its own personal and communal senses. Chalmers, David. The Character of Consciousness. Oxford: Oxford University Press, 2010. The Australian National University philosopher and possibly the most sentient scholar in this field follows up and expands on his 1998 classic Six sections engage the Problems, Science, Metaphysics, Concepts, Contents, and Unity of Consciousness. See also his 2014 Constructing the World (search). Chalmers, David. The Conscious Mind. Oxford: Oxford University Press, 1996. In a centerpiece book for the field, the University of Arizona philosopher makes a strong case for the reality of consciousness as more than a neural epiphenomenon. For a full appreciation of consciousness, a close relation with its information content is required. Chalmers’ website: www.u.arizona.edu/~chalmers/online. contains over 1100 papers on every aspect of the study of mind and sentience. See also Chalmers 2013 major work Constructing the World, reviewed in Current Vistas. Changeux, Jean-Pierre. Reflections on the Origins of the Human Brain. Lagercrantz, Hugo, et al, eds. The Newborn Brain: Neuroscience and Clinical Applications. Cambridge: Cambridge University Press, 2010. Noted also in Phylogeny and Ontogeny, the College de France, Institut Pasteur, neuroscientist provides a luminous addition via the latest appreciations of pre- and post-natal, fetal and infant, cognitive states to the processive advance of knowing consciousness. See also his chapter “The Molecular Biology of Consciousness” in Consciousness Transitions (Elsevier, 2007). Cleeremans, Axel, ed. The Unity of Consciousness. Oxford: Oxford University Press, 2003. A collection of leading edge papers which consider how the phenomenon of knowing sentience evolves and arises in embodied persons. Clement, Fabrice and Abraham Malerstein. What is it Like to be Conscious? The Ontogeny of Consciousness. Philosophical Psychology. 16/1, 2003. A study of the sequential lifetime phases of awakening ones individual sentience. This process is seen to move from initial phenomenal awareness in infancy to an ‘access’ of shifting representations for appropriate responses and onto the formation of a rational self in latter childhood. Throughout the paper is a tacit recapitulation between our personal ontogenesis of learning about the social and natural world and the cognitive phylogenesis of humankind.